It was from this medieval mosque that the militants' leader Abu Bakr al-Baghdadi declared a self-styled ''caliphate'' spanning parts of Syria and Iraq three years ago. 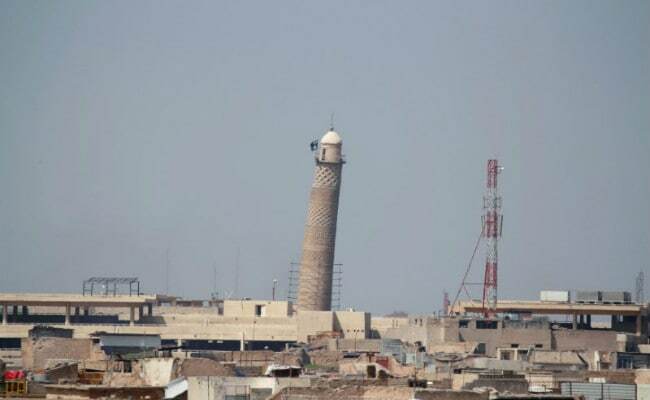 MOSUL: ISIS terrorists blew up on Wednesday the Grand al-Nuri Mosque of Mosul and its famous leaning minaret, an Iraqi military statement said. ISIS's Amaq news agency accused American aircraft of destroying the mosque. "The Daesh (ISIS) terror gangs committed another historical crime by blowing up the al-Nuri mosque and its historical al-Hadba minaret," the Iraqi military statement said, . The forces had encircled on Tuesday the terrorist group's stronghold in the Old City, the last district under their control in Mosul. Al-Baghdadi proclaimed himself "caliph", or ruler of all Muslims, from the pulpit of the mosque on July 4, 2014, after the insurgents overran parts of Iraq and Syria. His black flag had been flying over its leaning minaret since June 2014. The fall of Mosul would, in effect, mark the end of the Iraqi half of the "caliphate" even though ISIS would continue to control territory west and south of the city, the largest they had control of in both Iraq and Syria.